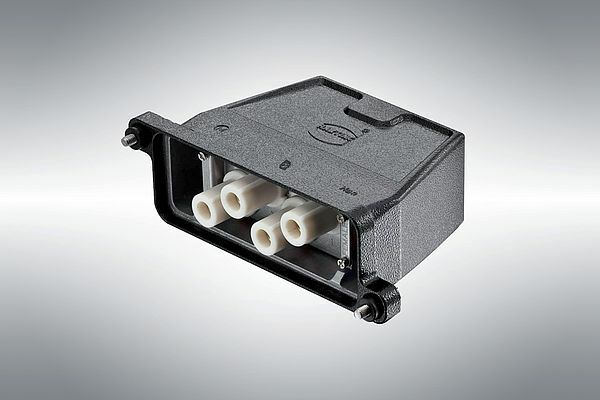 Available with 35 mm2, 50 mm2 and 70 mm2 termination cross-sections, the Han HC 250 from Harting is rated at 250 A/2000 V. The single-pole crimp module can be connected in various frame geometries to produce the required number of poles in a compact space. Four-pole interfaces, for example, come in size 24B HPR housing and are particularly suitable for motor connections. A removable tool for simple installation and removal of contacts and inserts is available. The connectors’ housing, made of high quality plastic, offers very good smoke and flammability characteristics. Multiple coding options for individual inserts prevent confusion while connecting.